Someone’s walking around in kissy-kissy shoes! And kissy-kissy shoes equals happy me! Jin-wook hasn’t realized it yet but his body is showing signs of L-O-V-E. Jealousy, spitting nonsense phrases strung together, telltale signs we’re gonna get there soon! We are also teased with the real-age discovery multiple of times which makes me sit on the edge of my seat! Read on! Joo-hee’s dragging Yoon-seo everywhere, searching for So-young, thinking she’s a cleaner with a talent for design. Yoon-seo sees that So-jin fits Joo-hee’s description and calls her So-young. So-young readily answers and uh-oh. Yoon-seo asks her if she is Lee So-young and not Lee So-jin and So-young trembles while thinking of a way out, which Yoon-seo notices with a satisfied smirk on her face. She explains that her sister’s name is Lee So-young and she’s so used to hearing people call that name that she gets confused at times that she just responds. Thankfully, Yoon-seo drops it there, FOR NOW. Gah, I get so agitated when Yoon-seo almost discovers the truth! So-young sighs a big sigh of relief for getting out of the sticky situation. The MDs are having a meeting about lowering the cost of clothing and they all go out to their assigned designers. Apparently, this is a dance between the designer and the managing director. The designers do their best to convince the MDs not to cut costs. For instance, Manager Jang lectures down the MD because he’s his sunbae in the company while Nara undermines the knowledge of the MD while Mi-soon tries the pity card. But unlike the rest of the MDs, Jin-wook even encourages So-young to add a scarf to make her design look nicer, even though it will cost more. I must agree because the jacket in itself is pretty bland. So-young is happy about Jin-wook’s suggestion and encouragement and even compliments him and his idea. Jin-wook’s mighty proud of himself and I can’t help but smile with him and his childish thinking. His face tells it all! They play with the scarfs, scarf-ing each other up and Jin-wook even accidentally touches the mannequin’s breasts. Why do I find it cute that he’s like a kiiidddd? They go to the jokbal (pig trotter) restaurant again for lunch. But this time, Jin Wook is more open and even gives So-young some fun facts about jokbal. He can even tell from which part of the pig a certain cut of meat came from! The restaurant’s owner goes to their table and asks Jin-wook how is his father. Jin-wook is displeased and tries to shoo away the man but he keeps on talking. In fact, the owner knows Jin-wook and his father and that they were co-workers once. He even knows that Jin-wook isn’t in good terms with his dad and that he left home to be independent. So-young is surprised by what she learned but is unexpectedly supportive of Jin-wook. So-young: “That’s also pretty good. That means he’s healthy, isn’t it? If he still has a temper. I’ve always thought that not having a father isn’t a big deal, but now I am thinking of him every day. Rather than saying I miss him, I might as well say it’s because of guilt. I don’t know where he sleeps, I wonder if he eats on time or not.” Aaaawww, girl. She shoves food into his mouth and I spazz a little inside. An idea comes to Joo-hee after a phonecall with Seung-il, that is to hire So-young as Hyun-yi’s babysitter. She asks to meet a busy So-young at a café nearby the office. Suddenly, Seung-il comes and they don’t know why they’re there. It seems that Joo-hee intends to introduce So-young to her brother to gether a better position at the office. That or she’s introducing her as Hyun-yi’s new babysitter. Unfortunately, So-young was sitting near the big glass window so it’s very easy for passers-by to see her inside. And that’s when Nara and Mi-soon catches So-young and Seung-il talking to each other. They think they’re having a relationship. Seung-il says that his sister said she’ll introduce him to someone. So-young excuses herself and goes first. She sees Joo-hee walking so she hides behind a plant but drops her phone unfortunately. Jin-wook calls her and leaves a message that the scarf is out of stock and that he put so much effort to get it. His sunbae then tells him to cut the cost and he defends So-young and her design. Jin-wook’s sunbae tells him that So-young’s jacket might not even sell. Back at the office, both girls start to spread the rumor that So-young might indeed be having a special relationship with their president. Jin-wook is actually there buying a drink and he overhears the conversation. He’s now pissed knowing that they were together. So-young comes in and Jin-wook is peeved and the others don’t even look her in the eye. He’s mad and So-young thinks it’s because she didn’t answer the phone. Jin-wook takes it out on her and starts to act weird. For instance, he even suggests changing the fabric of her jacket to reduce the cost. He’s suddenly not giving her the scarf because the company wants to reduce the production cost. Instead, he vexingly gives her some cheap buttons to substitute for the scarf. But then, Jin-wook overhears his MD sunbae and Director Hyun talking about brushing So-young’s design aside and giving a full budget support to Yoon-seo’s design. Jin-wook checks Yoon-seo’s design and finds out that her fancy vest budget is way more expensive than So-young’s. Yoon-seo tells him that MD Go approved the budget. Jin-wook retorts that it’s his job and that MD Go robbed his work again. Pissy-pissy pants, I love thee. Jin-wook watches So-young struggling to use the buttons he gave her. Being the righteous man, he decides to do the right thing. Light bulb moment! He goes out to the street and holds a market survey. He asks girls to choose which jacket they prefer to buy then gives them refreshments. If I was there, the sight of Daniel Choi is enough of a reward. He also goes out to different department stores to ask them which of the two jackets would sell more. After a day out conducting a fast market research, he presents the statistics to his sunbae, telling him that So-young’s design was proven to win over Yoon-seo’s in the real world. His sunbae just brushes him off and tells him that he’s crazy for taking out incomplete samples outside. Jin-wook tells him that he’ll support So-young’s design all the way and that he will take responsibility for it. Jin-wook comes in the designer studio and complains that So-young’s not answering her phone. Jin-wook jibes that she’s lying that her phone is broken and sees that it is truly broken. So-young is obviously mad at him for giving her the scarf then taking it away. She doesn’t mind him and continues to work when Jin-wook coughs and puts a scarf on the mannequin. He tells her that they’re going with the original design and to screw those buttons. He smiles and she smiles and he smiles more because she smiled. So cute! Jin-wook asks So-young to buy him udon for dinner and So-young tells him to go to the restaurant first because she still has work to do. Before going to the restaurant, he buys her a new cellphone as hers is broken. He waits in front of the restaurant, cellphone in hand, getting a lil bit frustrated why So-young’s taking so long. But suddenly, So-young gets a phone call from Hyun-yi saying she’s alone at home. So-young rushes to President Ji’s home and calls Jin-wook to inform him that Hyun-yi called and that she can’t eat with him. She hangs up the phone on Jin-wook and Jin-wook’s mood is getting sourer by the minute. But when So-young arrives at the apartment, Hyun-yi just conned her because her babysitter is still there. So-young uses the restroom and when she gets back, she tells Hyun-yi that she’s going home. But not to be outsmarted, she tells her that she let the babysitter go home and so, So-young is now stuck with Hyun-yi. While So-young is at the bathroom, Hyun-yi rummages her bag and finds her ID. Hyun-yi sees the number 78, corresponding to So-young’s birth year. Hyun-yi asks about it and when So-young can’t answer, she muses that it must be So-young’s IQ. So-young just agrees and Hyun-yi ridicules her that she must have been embarrassed since a chimpanzee’s smarter than her. Hyun-yi makes So-young cook dinner for her. 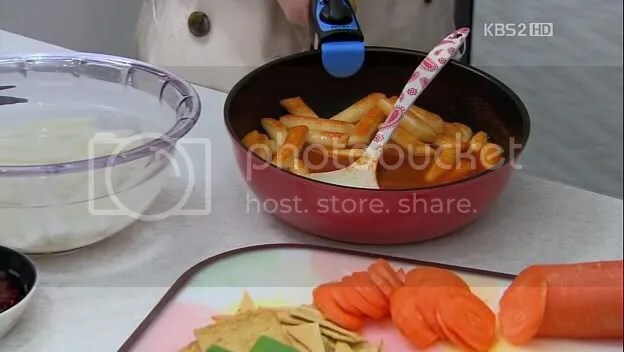 So-young cooks ddeokbokki (a rice cake snack) but Hyun-yi says that she can’t eat it. The kid tells So-young that her father doesn’t want her to eat ddeokbokki because she’ll have pimples. That turns out to be a lie when President Ji finally comes home. He’s surprised to see So-young and So-young tells him that he’s sorry for cooking ddeokbokki. Surely, he doesn’t want Hyun-yi to each such food. Hyun-yi just chuckles that So-young is so gullible to even believe that. She tells her father that So-young will be their servant. Jin-wook’s upset and rants in the office. Hee. He walks around and finds a way to contact So-young. He even asks around for President Ji’s cellphone number and address. He can’t help himself to find out what So-young’s doing at the President’s house. He calls a taxi and gets going. Meanwhile, So-young serves ddeokbokki. She asks to leave first but Hyun-yi blackmails her into staying using the IQ secret, taunting that she’ll tell his father. Seung-il serves some ddeokbokki for her and she tries to stop him, wanting to just serve herself. Yoon-seo comes with bread in hand and So-young tries to leave. Seung-il explains to Yoon-seo that Hyun-yi called So-young. So, Yoon-seo sits down and Hyun-yi makes Yoon-seo eat some rice cake. Hyun-yi: “If you leave any behind, you’ll go to hell.” Attagirl! Hyun-yi asks a series of who’s prettier questions and declares that in her opinion, So-young is prettier than Yoon-seo. She asks his father and he deflates the question, telling her that in his eyes, Hyun-yi is the most beautiful. Aaaaww. Hyun-yi presses his father for an answer: is it ddeokbokki ahjumma or bread ahjumma? Seung-il responds that he doesn’t know and that they’re both pretty. Poor Yoon-seo. You deserve it. Hyun-yi then changes the question, asking who he’s closer with. So-young tells them that she’s leaving first when the doorbell rings. Jin-wook arrives and is surprised to find a full house. How he explains the reason of his sudden coming is hilarious. You need to see it, complete with the hand gestures. He’s just blabbing nonsense and he ends up eating dinner with them. Hyun-yi grills him and asks who he’s closest with. He answers that he’s not close to So-young because she’s too thin and short and ugly and that he has high standards. But he can’t also bring himself to say that he’s close with Yoon-seo and Hyun-yi tells him that he’s clearly closer with So-young because why would they be having dinner if he’s not close to her. Smart kid, iluvett! They go out of the room and argue once Hyun-yi’s asleep. Jin-wook is mad that she didn’t answer his calls when she answered Hyun-yi’s. He also brings up So-young hanging up on him a while ago. Tch, he’s just masking his jealousy! I think he doesn’t know it yet but I’m sure that what got his hackles up was the fact that So-young went to President Ji’s house. Not the rumors, not the not answering the call, not the broken phone, not Hyun-yi. Alas, the apartment is not that large, so Yoon-seo and President Ji catches them fighting. Seung-il apologizes to Jin-wook and tells him to get So-young home. So-young refuses so President Ji offers a taxi for So-young, which she also refuses. Jin-wook looks totally annoyed by President Ji’s care so he says that he’ll just get So-young home with the taxi President Ji gets her. Once they got out of the house, they start arguing again. So-young is furious and asks Jin-wook what he actually wants that he came by President Ji’s house and embarrassed her. She tells him that he should not include her in his emotional mess, what with him liking Yoon-seo when she likes the President. She’s talking too fast and too much that Jin-wook just holds his anger in with his teary eyes. So-young keeps on yelling and complaining until to her surprise, Jin-wook grabs her and bends down for a kiss! How cute it is that he’s bending his knees that much just to be at her level. Haha! So-young gets more upset because it’s her first kiss and that this guy who’s seven years younger than her stole it. She’s rolling in bed that night, while Jin-wook looks sorry but ultimately does not regret it. The next day, Jin-wook catches the elevator and he sees that So-young’s inside. He can’t bring himself to go in and they just stare at each other. Manager Jang catches up to the elevator and pushes Jin-wook inside. Jin-wook and So-young act awkward with each other and Manager Jang smells the tense air. Manager Jang finds it strange and then wittily hits the jackpot and guesses that they kissed yesterday. The two vehemently denies it which makes Manager Jang laugh and he comments that that’s what happens when two people stick to each other often. President Ji is having brunch with Yoon-seo and Director Hyun. Director Hyun is obviously proposing to get rid of Director Baek by sending her to their China branch overseas. But Seung-il loves his teacher very much and goes to Director Baek’s office, telling her that he would never let her go even if they told her to. Aaaawww. Really, aaaawww. Jin-wook apologizes to So-young for the kiss by the vendo machine. He says they need to clear the situation since they have to work together. He doesn’t say that he regrets it or that he dislikes her and just tells her that he went out of his mind. No, you did right, methinks. The designers get curious again about So-young’s age after she slipped that she watched an old movie in the theater. They’re asking if she’s certainly 34. Nara requests for her to sing the song “Lie”. So-young sings G.O.D’s “Lie”. Everyone is surprised and Nara asks her why she is singing G.O.D’s “Lie” when she should be singing Big Bang’s “Lie”. So-young thinks fast and counters that her elder sister is a fan of G.O.D and that she was practically there during her sister’s fandom. My sister can agree with that. Anyway, all this time, Yoon-seo is listening to everything. She is now more suspicious than ever about So-young’s name and age. Director Baek sees So-young working and notices her hands. She mutters that her hands look like it’s been doing this line of work for several years now. She shows So-young her hands which resulted from 35 years of working with fabrics. She tells her to take care of her hands especially that she’s not married yet. I kind of dig it that everyone is given hints about So-young’s real age. Sun Nam, the landlord to So-young’s house, finds out from her mother that she got a job at The Style as a designer. So he calls the office, since So-young’s phone is broken, and asks for Lee So-young. Mi-soon has no idea who is Lee So-young but Yoon-seo takes over the phone call. She asks him if he means Lee So-young with a younger sister called Lee So-jin. He answers yes but Yoon-seo tells him that there’s no such an employee. Yoon-seo then calls Joo-hee to meet up and she also calls for So-young. I think she is setting So-young up. So-young enters the room where Joo-hee is in. So-young is surprised and asks Joo-hee to go out when Yoon-seo comes by. Yoon-seo asks if they know each other and Joo-hee surprisingly answers that she knows So-young very well for she used to be her teacher. So-young has no idea what’s going on but she just nods and says yes. She excuses herself first. Yoon-seo fails with her Joo-hee plan but there is nothing that will put the brakes on this woman. She still has one card, So-young’s former boss. She calls him and he instantly perks up. She asks if he’s very familiar with Lee So-young. Gah! Can I have a smiling gif of Jin-wook? Why am I a sucker of smiley, adorkable guys? I’ll speed up the recaps I promise, if someone will give me some Baby-Faced Beauty art. Heehee. Way to go, self. It’s just that there are tons of scenes in this drama that it takes me eons to finish a recap. As a watcher, I love that because I despise senseless, no-use-to-the-plot facial close-ups and brooding and angsting. But for a recapper, it’s hard! I salute you, javabeans and girlfriday and all the awesome recappers here. Just, woah. I like that So-young’s family and Yong-joon are taking a backseat in this episode because I don’t need another scene to recap. I mean, we all want Jin-wook and So-young and Seung-il to be the focus of the episode. And Hyun-yi, how can I forget Hyun-yi? Seriously, that kid has the bossy, blackmailing act going on. I was like, make your dad answer that So-young’s prettier! Haha! P.S. How happy am I that Big Bang’s “Lies” was mentioned here? I’m a HUGE fan of Big Bang and they are actually my first Kpop group. So I guess I’m part of the Big Bang generation. Hee. Kbs world begins the first episode today,am so excited coz all the recap site agree this is one fantastic drama and i agree after reading.thax for the good work!! It’s such a lovely story ! I like your work too 🙂 btw .. may i know , what is the lullaby song title that soyeong sing together with hyun-ni ?